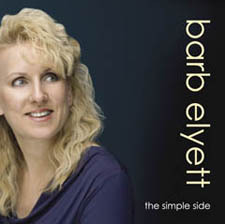 The Simple Side is the first CD released from Contemporary Christian singer/songwriter Barb Elyett on her self-owned label, Aleta Records. With artistry and pure passion, Elyett focuses on her dynamic voice, using her piano as a highlight. Elyett has received recognition and praise for her music from people all over the world, and was recently honored to place among the top songs in the Billboard World Song Contest with her song, "Come To Me." The Simple Side is a blend of touching, heartfelt songs "Only You Know;" clever lyrical jewels with swaying rhythms "Thorns and Fragrant Roses;" and upbeat, infectious melodies with precise instrumentation "Abandoned Nets." The Simple Side was produced by award-winning Vancouver producer and engineer, Bill Buckingham (Carolyn Arends, Rita McNeil). Musicians on the project include Barb Elyett (vocals, piano), Bill Buckingham (acoustic and electric guitar, digital programming), Dave Pickell (Hammond Organ, additional piano), and Gord Maxwell (additional background vocals). Accenting the unique, soothing sound of this album is a timeless message of wisdom and truth. Each song beautifully shares a scriptural key to simplicity that paves the way to peace. Elyett's mastery for creating music that not only pleases the ear but soul as well is paramount throughout this entire project. To experience Elyett's music is to feast on art that is one-of-a-kind. Elyett has the ability to sing and write songs that drip with compassion yet boldly and aggressively drive home the point she is trying to make. Discover the spirit, vision, and vulnerability unleashed from within Barb Elyett on The Simple Side.